The Collaboration Pods facilitate in-person, interactive, small group projects or meetings. Utilizing Steelcase Media:Scape Mini 42” plasma screen, team members can easily and quickly display up to four (4) laptops on the shared screen. 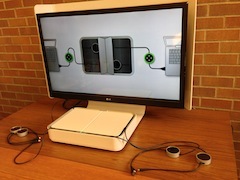 The collaboration pods are located throughout Odegaard library, and do not require a reservation for use. The Collaboration Pods in Odegaard are walk-up systems and do not require a reservation. If you need help with the Collaboration Pods, or need to report a problem, please email help@uw.edu.